SBI Admit Card 2016; State Bank of India conducts various recruitment process to gather staff in its Banking Service. Recently SBI released a notification for recruitment of huge vacancy in clerical cadre. Online Application Registration has been end up on 28/04/2016. Read this post on how to get SBI Clerical 2016 Admit Card. SBI Clerks Admit Card & Syllabus 2016 for Recruitment Examination of Junior Associates (Customer Support & Sales) And Junior Agricultural Associates in Clerical Cadre in State Bank Of India. As per notification we all knew that the SBI Clerical Cadre Recruitment 2016 is likely to be held on May/June 2016. The Selection test will be held through Computer Based Online Test. Candidates may get their admit card 15 days prior examination. Examination date for SBI Clerks Recruitment has not been declared so far by State Bank of India. It is expected that the SBI Clerks Online Examination 2016 will be commencing at the end of May 2016 and candidate may get their Admit Card for SBI Clerks 2016 Preliminary Exam from 11/05/2016. Call Letters/Hall Tickets for Main Examination will be available from 17/06/2016 and the Main Exam is likely to be held at the end of June 2016. Your venue information and exam schedule will be mentioned in your Admit Card. Exam Date of Preliminary Exam of SBI Clerk : End of May 2016. Exam Date of Main Exam of SBI Clerk : End of June 2016. 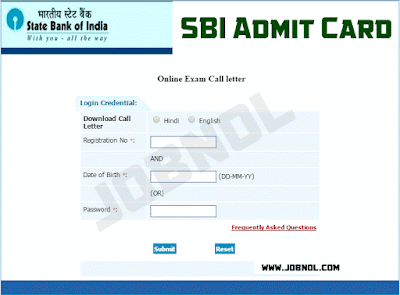 How to Download SBI Clerks Admit Card ? SBI informed that "No Hard Copy of The Call Letter/Acquaint Yourself Booklet Will Be Sent By Post", so candidates need to download their admit card through online mode. You will get an Information Handout/Acquaint Yourself booklet at the time of downloading admit card, you can know everything from that prospectus. Your Online Registration No and Password/Date of Birth will be required for Downloading of Admit Card. follow this steps to get your Admit Card. Now Enter your Online Registration No. Now Enter Your Date of Birth(MM/DD/YY) format or your Password (Password Received on your phone via SMS at the time of Online Registration). Now Click Submit To get your admit. Your Admit Card will be displayed on screen and there will be print option by which you can take printout of your Admit Card. Also you will find there an option provided to save the Admit Card in .pdf file by which you can save/store the admit card permanently as a softcopy in your hard disk/email/online storage for further needs. Each test will have separate timing as mentioned above. The questions in objective tests, except for the test of General English, will be bilingual i.e., English &Hindi. The candidates are required to qualify in each ofthe Tests by securing passing marks, to be decided by the Bank. There will be negative marks for wrong answers in the Objective tests. 1/4th mark will be deducted for each wrong answer. Candidates will have to pass in each ofthe objective tests. Candidates qualified in the test (main examination) will be placed according to their marks in descending order in respective categories. Depending upon the number of vacancies only certain number of candidates from amongst those who qualify by ranking high enough in the merit will be called for interview in the ratio of maximum 3 candidates for each vacancy. Candidates are required to score a minimum percentage marks (to be decided by the bank) in interview to be considered for final selection. 5% relaxation for SC/ST/ OBC/PWD/XS category will be available thereon. Note: Interview call letters will be uploaded on the Bank's website after declaration of result of online test. Candidates will have to download the same from our website. No hard copy of interview call letter will be sent by post. Test of knowledge of official and/or local language: Those who produce 10th standard mark sheet/certificate evidencing having studied official (local) language will not be subjected to any Language test. In case of others, language test will be conducted at the time of interview (if interview is held) /before final selection (if interview is not held). The marks obtained in the Preliminary Examination (Phase-I) will not be added for the selection and only the marks obtained in Main Examination (Phase-II) will be added to the marks obtained in Interview (Phase-III) (if interview is held) for preparation of the final merit list. Final selection will be made on the basis of candidate's performance in the test (main examination) and interview (ifinterview is held) taken together. Results of the candidates who have qualified for Interview and the list of candidates finally selected will be made available on the Bank's website. Final select list will be published in Employment News/ Rozgar Samachar. 0 Comment to " SBI Admit Card/Call Letters & Syllabus for 17000 Clerks Junior Associates of Customer Support & Agriculture - sbi.co.in "